The Star of Spain Rafael Nadal made history on the weekend, the Spaniard defeated David Ferrer 7-6(1), 7-5 on Sunday’s Barcelona Open final-to became the first player in open Era to win two different tournaments seven times each. This success came just days after he trashed world number 1-Serbian Novac Djockovic for his 8 consecutive Monte Carlo Masters title. On Sunday-Nadal, he inflicted Ferrer’s fourth lost at Barcelona Open finals, the Spaniard saved 12 of 15 break points for his 34 victory on clay against him, It was his 21st straight win on clay followed up his eight back to back win in Monte Carlo. No wonder he is called “the king of clay” indeed he is-but I’ll like to call him “The Bull King of clay” sound pretty not cool-hey-lets rather leave it there. The 25 years old left handed tennis player has a phenomenal record under his belt-in singles alone is at 568-119, which gives him an incredible 82, 55% winning ratio-amazing! 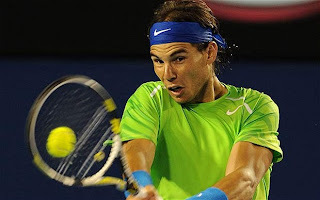 In Grand Slam Singles results: in 2009 he won his only Australian open title-he have 6 French Open titles in his collection, followed up with 2 Wimbledon championships and one US Open title-which he achieved in 2010-still not amazing? Incredible is in it?! In 2008 he won an Olympic Gold medal for Spain in men’s tennis in Beijing-that just wow!! Nadal-hold on, he has a stuttering 48 career titles, some can only dream of a quarter. In doubles-he still perform his magic touch too! As he stand at 97-59 which still gives him an amazing 62. 28%-a C at high school! These goes with 8 titles. He finished runner up in US Open 2004- and third in Australian Open in 2004 and 2005-took second in 2005 Wimbledon tournament-the king of clay for sure he knows his way around the tennis court. Not so impressive ranking though-as he is ranked 59- maybe he doesn’t enjoy being around people! As on singles he enjoys a superb second world ranking and looks as if he wants to retain that number 1 ranking spot-which he was replaced by current world number 1 Novac Djockovic on 3 July 2011. He was born in a mixture of a family-as his farther was a business man and his mother a housewife. His uncle, Miguel Nadal was a soccer player whiles another Uncle Toni Nadal was a professional tennis player. Rafael had skills for both soccer and tennis-and was good at both, but when he won his first tennis title at the age of 8 and at 12 he won Spanish and European tennis titles-it was clear that tennis was his career. And 17 he beat Roger Federer-to become the youngest man to reach the third round at Wimbledon since Boris Becker. And in 2003 he archived the ATP Newcomer of the year award-maybe that the reason he uses to bit trophies he has won.